Voila! 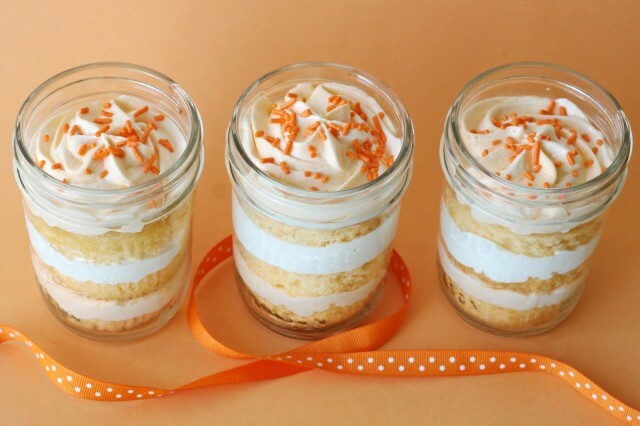 Orange Dreamsicle cupcakes in a jar! For the recipe, just head over to my friend Shelly’s blog, Cookies and Cups. Are you tired of cupcakes in a jar yet? I hope not! I have a few more I’m still dreaming on! 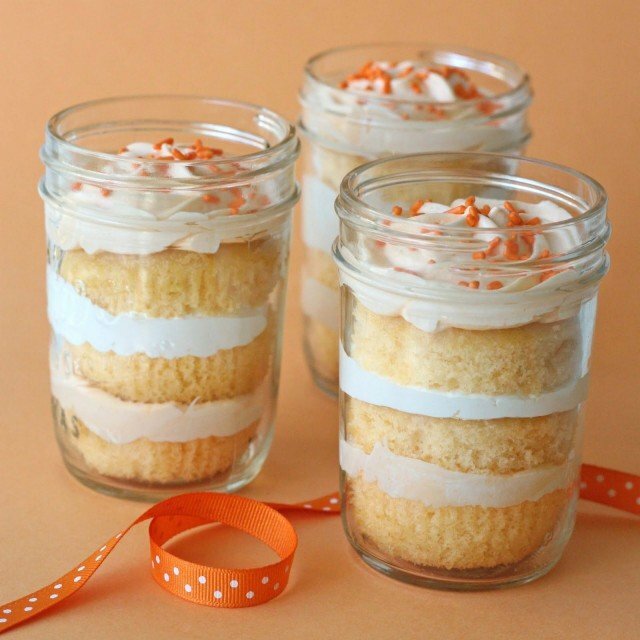 Of course any of the cupcakes in a jar can be easily adapted as a ‘regular’ cupcake, or even a cake. all your recipes look so perfect… i love it Glory! I really like how the cupcakes looks in a jar. Thanks for sharing Glory. It is great and so easy to handle. You are amazing. Thanks for sharing! wow, what a great space you have here! 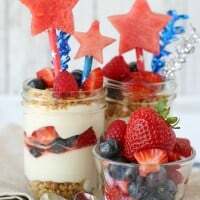 I don't think I will ever get tired of cupcakes in a jar I love your styling and ideas! Do you think you could use ice cream in lieu of some of the frosting layers? oh god those look delicious! I love the look of these…so simple and home made! I love the jar idea, that is so cute! I love cupcakes and orange dreamsicle is one of my favorite flavors. Three of my loves together! I'm not tired of them!!! I love these cupcakes in a jar and I want to see more! Plus, it looks like you get more frosting this way. I have been obsessing over these since I saw them over at Cookies and Cups this morning. They sound FANTASTIC. I can't wait to try them! I am working on these today. Have made the cupcakes. they are cooling right now! can't wait to see how they come out! Too cute and they look yummy. What a clever presentation idea! Love it! Will have to give this a try for my next get-together. I made these yesterday. Although they didnt come out as pretty as yours they are still SOOOOOO yummy! I just clicked on the link for the recipe and I didn't get the recipe. I love the looks of these and I am sure they taste delicious. 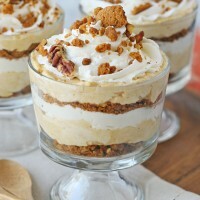 I was so excited to make these but when I served them the next day they were so soggy!! Do you always serve yours right away? So good !!! 😀 Will try them. 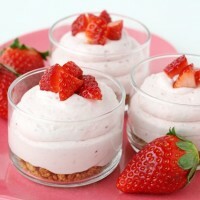 Looks awesome n yummy! could you pls share the tips on taking this photo? How do you get that background pls? The background here is just a piece of scrapbooking paper. To make it show up in both the background and below the cupcakes, I just curved it up against a larger piece of foam board, so there is no “seam” where the bottom and background meet. Thanks a ton Glory! I guessed it right! I am more interested in food photography n impressed with all your pics. could you pls share some tips on sazee10@gmail.com pls? How many jars does this receipe fill?